Junk and Rubbish Removal Services in Arizona. 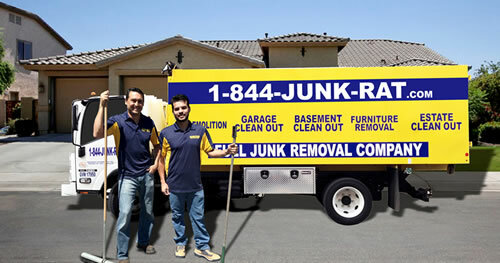 At 1844-Junk-Rat – junk and rubbish removal in Arizona is made easy… because we do all of the work! Clients in Arizona are full of praises for our services for one simple reason; 1844-Junk-Rat.com has the best prices paired with the most available services in the whole Arizona area. Basement clean outs are a breeze with our skilled haulers handling all the heavy work. Offices that need mass trash removal rejoice when we show up at their door since we handle all the details such as recycling, dump fees and after removal clean out. Does spring time mean mass cleaning and piles of junk and trash in your yard, that’s no problem for us here at 1844-Junk-Rat.com, after all we are the junk people. When you call our office, you will be greeted with a patient customer service agent who will get the details of your project and give you a quote before setting up your appointment. We are available on short notice for those last minute garage clean out, yard clean out or any junk removal jobs that can pop up after an unexpected weekend project leaves you with piles of leftovers that need to be thrown away. Any one who knows the area knows that basements are the catch all for just about any type of clutter a family can accumulate. During our spring cleaning we decided to get rid of all the things that we don’t need that have accumulated over the years. We called 1844-Junk-Rat.com to help us with our Basement Clean Out since they advertised that they do all the work. This was a sticking point for us since we are getting up in age and can’t really move heavy items about anymore. The group that came out from 1844-Junk-Rat.com was really nice the whole time. They communicated well when they were unsure if items we separated were to be hauled away or saved. After taking care of all the junk, they were also kind enough to sweep the basement too! Pricing, really affordable which is important for retirees on a fixed income. They will get all of my business in the future and suggest you send yours their way too! visit our pricing page for details.